If you have been on the internet recently, you have probably seen the picture of the dress that is leading to heated debates and driving everyone crazy. The problem is that when some people look at the photograph of the dress it looks blue with black stripes but others see the dress as white with gold stripes. The dress can only be one or the other, so how can people see to different sets of colors? Sounds like a job for the Eye Mythbusters. At first you might be tempted to think that it has something to do with color blindness. People who are color blind would not be able to see the dress with the same colors as someone who is not color blind. However, this is not the answer since two people who are not color blind see two different sets of colors as well. So what is going on here. First, you have to understand that what we see is a product of our brain. All our eyes do is sense light and send those sensations to our brain. Our brain then takes that information and creates the images that we see. What our brains see is called perception. There is no color blue that is independent of our brain. What we see as blue is just a particular wavelength of light, it has no color on its own. It become blue when our eye detects that particular wavelength sends it to our brain and the our brain creates the perception we call blue. Second, our brain has developed different tricks so that what we perceive is advantageous for us. For example, when something moves our brain is adapted to notice this immediately so when we see a tiger lunge toward us we can pick it up quickly and move out of the way. There are many other tricks our brain uses as well and one of the tricks our brain uses is called chromatic bias. During the day the color of the sunlight varies. In the early morning and evening sunlight is more red but during the middle of the day it is more yellow. When we look at a colored object, it is advantageous for us to perceive that object as the same color throughout the day despite the fact that the color of the sunlight varies. The brain makes adjustments for this so that we see the colored object as more or less the same color despite the variation in the background light. This is chromatic bias. You will notice that the light behind the dress is very strange and this is why the dress appears as a different set of colors to different people. Some people’s brains interpret the background light as morning or evening light and so their chromatic bias kicks in causing the dress to be perceived as white and gold. 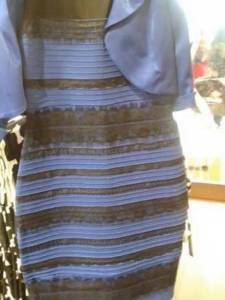 Other people’s brain interprets the background light as noontime light and causes the dress to be perceived as blue and black. What we see is actually something that our brain creates called perception. Our perceptions are based on certain assumptions our brain makes. The assumptions that our brain makes can differ from person to person and so what we perceive can be different from person to person.